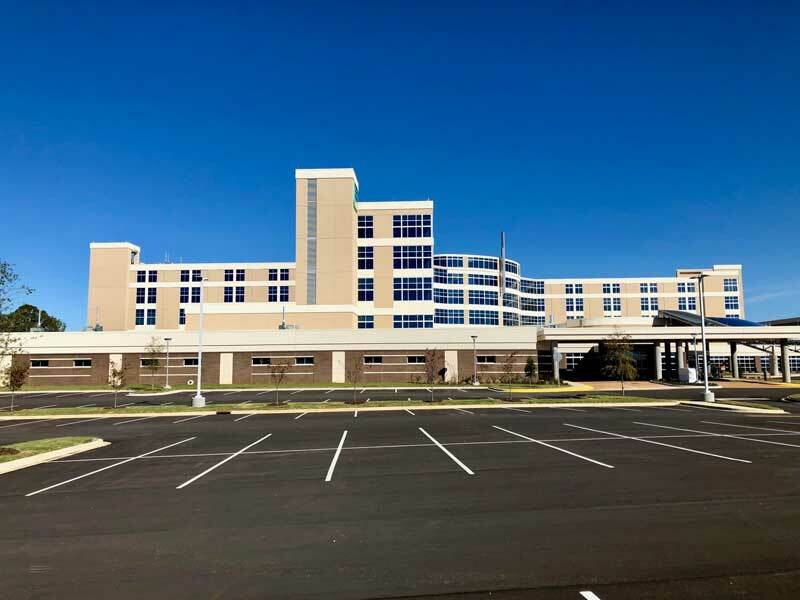 CIP was recently chosen as the commercial painting contractor for the new North Alabama Medical Center in Florence AL. The center serves Northwest Alabama, South Central Tennessee, and Northeast Mississippi, so people in these communities were anxiously anticipating the completion of this project, which began construction on February 3, 2017. Completed just before Thanksgiving this year, the new center replaces Eliza Coffee Memorial Hospital. CIP counts it a privilege to be a part of the construction of the most advanced technological facility the area has ever had. It is a $250 million-dollar, 450,000 square foot medical center with 263 beds. Working with the general contractor, Layton Construction Company, CIP applied interior and exterior finishes to meet normal hospital specifications. In addition, we also applied high-performance coatings on the exterior canopy and the exposed trusses in the atrium. These finishes provide optimal protection against abrasion, impact and corrosion and provide enhanced color and gloss retention. The main challenge of the project was the accelerated time schedule. We were able to meet our deadlines, even though it was more difficult to do so because other trades ahead of us were not meeting theirs. Subsequently, we had to adjust our schedule to overcome these delays. This is a typical problem in any project, large or small, when there are multiple trades involved, but we are experienced in dealing with it. Placing an experienced foreman onsite, seasoned in working out of town and working on large projects. Providing the necessary manpower to stay on schedule. Having our local supplier, Sherwin Williams, stay on top of orders and stock. In summary, the success of this high-profile project was due, in part, to Layton Constructions’ understanding of what the client wanted and needed. Layton strived to meet their completion date. And we pushed to meet our deadline for Layton by providing enough manpower to do the job. 1984, CIP serves our commercial painting We’ve been serving our clients in Nashville and across the Southeast since 1984. We can handle any size commercial painting project. Click the link more about our commercial painting services and our industrial painting services.